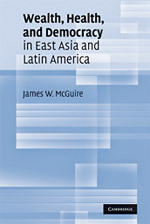 James McGuire’s recent book Wealth, Health, and Democracy in East Asia and Latin America (Cambridge University Press, 2010) was named a Choice Outstanding Academic Title 2010 and won the 2011 Stein Rokkan Prize for Comparative Social Science Research. McGuire is professor and chair in the Department of Government and a member of the Latin American Studies Program at Wesleyan. McGuire will receive the prize at the annual meeting of the ISSC Executive Council in Durban, South Africa, on Nov. 26, at which time he will deliver a public lecture on the book. More information about the 2011 Stein Rokkan Prize is online here. The Stein Rokkan Prize citation for Wealth, Health, and Democracy in East Asia and Latin America is online here.